« Buying my first commercial lawn mower. The lure of a few hundred dollars can at times tempt the newer lawn care business owner into jobs that they may not have the ability to perform. 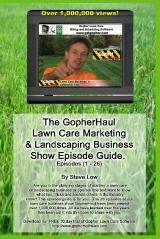 So before you take on a larger job that is outside your normal scope of operation consider this discussion from the Gopher Lawn Care Business Forum where one entrepreneur was interested in taking on a huge hedge trimming job but was unsure of what tools would be needed to perform it. 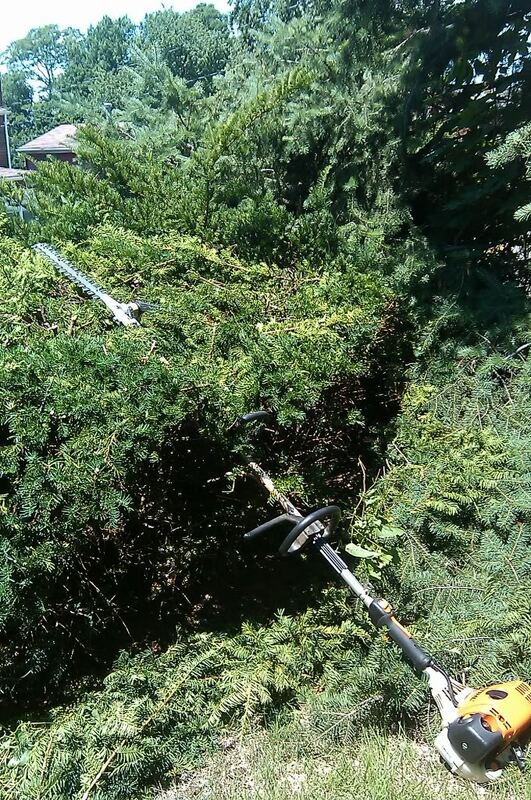 One lawn care business owner wrote “I have 2 customers who want me to bid on their hedge trimming jobs. I have a picture of the first one. To me I don’t think it’s that big of a job really they just want it cleaned up a bit. The hedge on the left is 59′L x 12′H x 5′D. That’s just for trimming and cleaning up 1 side. The customer might want me to do the back side that faces the neighbor. The hedge on the right is 53′L x 14′H x 5′D. It’s not too bad either, but the branches have leaned down in some spots, and will need loppers to fix. Again, those measurements don’t include the side that faces the neighbor. The 3rd hedge is HUGE. It’s 162′L x 12′H x 11′D. That’s only the side that faces the street. If I trimmed the side that faces the house it would be 324-feet long! The customer said she got a quote once before for not only the huge hedge, but doing a cleanup of the property. That price she said was $700, but she felt it was too high. I don’t have too many hedge trimming jobs, and certainly none of this size. Any help estimating time to complete would be greatly appreciated. I have a gas powered, light duty, trimmer, and another electric trimmer. I would be willing to buy the right equipment for the job(s) if I got them. 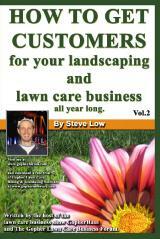 A second lawn care business owner said “let me review this. 11′ DEEP!!!??? Good freaking LUCK! A few years ago I had a hedge trimming job where I had to trim down some hedges to a manageable size. They were about 40′ long, about 15′ high, and 8′ deep. They were wider at top because they were too tall and falling outward. So with that said, $700 for something your size PLUS a cleanup does not sound unreasonable to me. 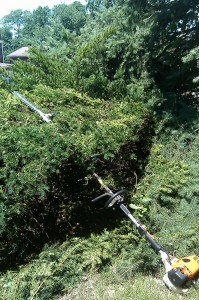 I now charge between 50 cents and $1/foot for normal hedges that are not above chest height. If they are wider than I can trim with a pass from both sides, I add to that. If they are higher than chest high, I add to that. With your job, you’re talking ladder work which involves risk of injury - CHARGE for that. I can’t imagine cutting that much without an extension trimmer - and a good one. I have a Stihl FS90R string trimmer that allows different heads to be swapped. I have an articulating hedge trimmer attachment for it and it works GREAT, but it’s still not long enough to reach in as deep as you are talking about. A third said “I do small hedges but my god, I have never heard of ones so deep. I was in a rich area of a nearby town a couple of years back and was shocked at the hedge sizes and designs I saw. My hats off to whomever trim’s what I saw as they sure knew what they were doing. This could be a dangerous job for you. To take this on, I would be tempted to see what a Kitty lift would cost in your area to rent. We use them for pressure washing jobs that have height. I can rent one on wheels for $250 to $350 a day depending on the unit. The down side to them is that they are heavy and do damage the soft soil. This entry was posted on Friday, May 20th, 2016 at 2:05 pm	and is filed under Hedge Trimmers, Hedge Trimming, How to Estimate - Services To Offer, How to Estimate Jobs, lawn care equipment. You can follow any responses to this entry through the RSS 2.0 feed. You can leave a response, or trackback from your own site.